Pamela Anderson and Rick Salomon officially parted ways last April. 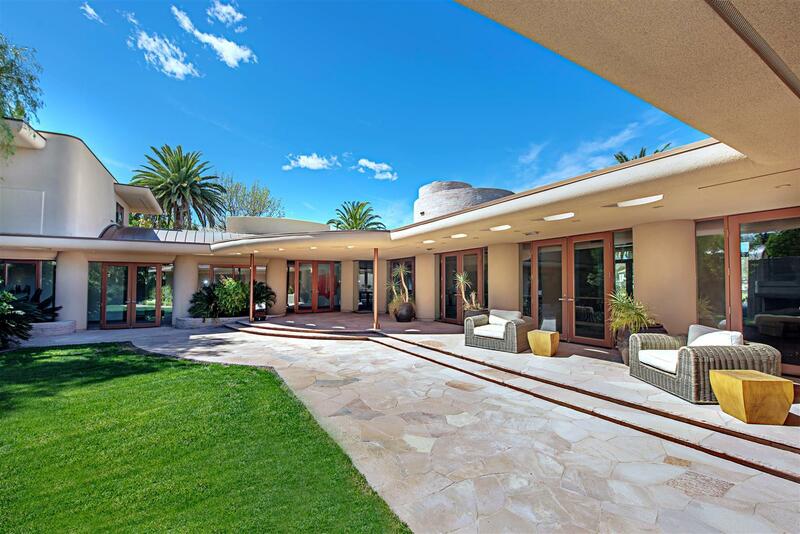 Now, a year later, the Frank Lloyd Wright-inspired dream home they spent more than two years searching for is for sale. The home, located in Summerlin inside the swanky Tournament Hills subdivision that’s anchored by a mammoth $32-million estate, officially hit the market last week with an asking price of $5.2 million. It is a custom 11,000-square-foot single-story with four bedrooms, seven bathrooms, and a four-car garage sitting on .82 acres that backs up to the eighth hole of TPC Las Vegas golf course. The home is built for entertaining with an 1,800-square-foot nightclub/game room that has a stage equipped with professional sound and lighting; and an oasis-like back yard that has a zero-edge pool that flows into a lower stream and waterfall, and sweeping views of the golf course and local mountain ranges. “Rock, water, wood and steel” were the natural elements that were central to the design and construction, which utilized industrial-level materials that will stand the test of time. Anderson’s eye for design is evident throughout, as she personally handled the interior design. The furnishings are not included in sale price, but are potentially available. The home is listed with Coldwell Banker Premier Realty agent Patsy Rios Franzi, a certified luxury Coldwell Banker Previews agent with more than 29 years experience. Franzi was the buyer’s agent when Anderson and Solomon bought the home in 2013. A virtual tour of the property can be seen at http://9028playersclubdr.lasvegashomes.com. Coldwell Banker Premier Realty is ranked among the nation's leading brokers in sales and innovation. The locally-owned company is ranked No. 8 out of more than 1,200 Coldwell Banker companies nationwide. With three offices in Southern Nevada (Summerlin, Henderson and Centennial Hills), the company presently employs more than 220 agents. With more than 25,000 closings that exceeded $1 million in 2015, Coldwell Banker ranked as the No. 1 luxury real estate broker in the world. Coldwell Banker Premier Realty Chairman and CEO Bob Hamrick previously served as Senior Vice President of CityCenter Realty Corporation and is recognized worldwide as an expert on the Las Vegas real estate market. Contact Patsy Rios Franzi at 702-768-9167 or patsyr@cbvegas.com for more information on the home or to schedule a tour.